The Catacomb Community is an ethnic and cultural society of the Middle Bronze Age (2500-2000 BCE), which was spread in the forest-steppe zones of Dnipro, Don and Volga rivers. The Northern boundary of their natural area embraced the territory where the Bezvodivka Solar Observatory is located. Catacomb Culture was explored by Gorodtsov V.A. in 1901-1903. The name of the culture is derived from the way their burials are situated in lateral niches of the burial pit, the catacombs. The Catacomb community improved the method of watching an eclipse through the two holes they made in the wall of the vessel, which some call “eyepieces”. Chalice of Catacomb culture. National Ukrainian museum of history. Photo © Oleksandr Klykavka. The ceramic vessel was constantly in burials, mostly beside the head of a dead person, in an upside-down position. It has the shape of ideal hemisphere and swings from touching, because of this shape it was deduced that it couldn’t be used as home ware because the contents would spill. Scholars paid attention to the holes in the vessel and discovered if someone looks at the hole from the opposite edge the diameter of the hole in the eyepiece is equal to the visible diameter of the Sun. The radius of the sector that is visible through the eyepiece is equal to the tenfold diameter of the Sun. The holes are similar, both are oriented toward the opposite edge of the chalice. Despite these observations, the purpose of the chalice remains unknown. The visible diameter of the Sun varies, but it is equal to 31′ 40″ (31 minutes 40 seconds) on average. Furthermore, the visible diameter of the Sun is equal to the visible diameter of the Moon. The tenfold diameter will produce 5 о 17′. 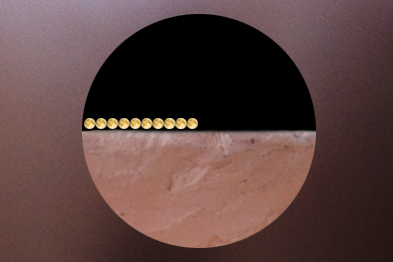 Given that the diameter of the chalice is equal to 19 centimeters, the diameter of the hole in the eyepieces is about 2 millimeters. sin 31’40” х 190 mm = 0,0092 х 190 mm = 1,75 mm. In other vessels, the second eyepiece is oriented toward the inside of the chalice. It has the same dimensions and the radius of the visible circle will be also equal to 5 о 17′. How did they use the chalice in practice? It is believed the chalice was placed so eyepiece holes catch the solar disc at the moment of sunrise on a summer solstice day. Then the chalice would be fixed and retained for half a year. At the winter solstice, they would look into the eyepiece at the moment of sunset and define the angle of Sun’s deviation – from the axle of the chalice and the point of sunrise on the day of summer solstice. The deviation equals 2 о 40′, which is equal to 4, 5 diameters of the Sun. The orbit of the Moon deviates from the ecliptic approximately 5 о 17′ as well. 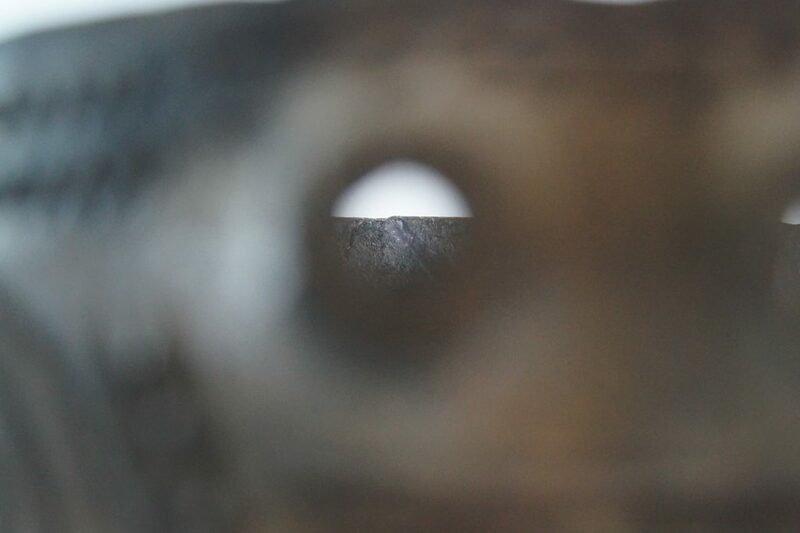 Sector visible through the hole of the chalice. The sector has a radius of ten visible diameters of the Moon. Created in Photoshop © Oleksandr Klykavka. The migration between the extreme north and south positions lasts 18 years and 11 days. This period is called “the saros“, after which the sequence of solar and lunar eclipses is repeated. Thus, the chalice could be a tool for determining the dates of astronomic events such as eclipses. They used to pour water into the chalice, look into the left eyepiece and wait for the eclipse of the Moon which, according to the rules of celestial mechanics, takes place 13 days before a solar eclipse. The ornament of the chalice contains the pairs of lines with 13 or 14 dots in each. It is known that 13 days before the sun eclipse and 13 or 14 days after it the Earth drops a shadow on the Moon. It means that in the period of 27 days which is called “the dragon month” the Moon’s orbit, Earth’s ecliptic and the Sun are in the same plane. That is why the lunar eclipse can happen. The ornament on the chalice is a tool that facilitated calculating the astronomic cycles of celestial bodies. There are also, four circles with dots are on the vessel. Two of them have 8 dots, one has 13 and the other has 19 dots. Looking through a hole on the Sun Chalice. National Ukrainian museum of history. Photo © Oleksandr Klykavka. Among scientists is accepted that the periods of the minor saros (18 years) and the major saros (56 years) had been specified by “civilized” peoples 4500 years ago: the ancient Babylonians, Egyptians and Chaldea. However, ancient Ukrainians were not included in the list. 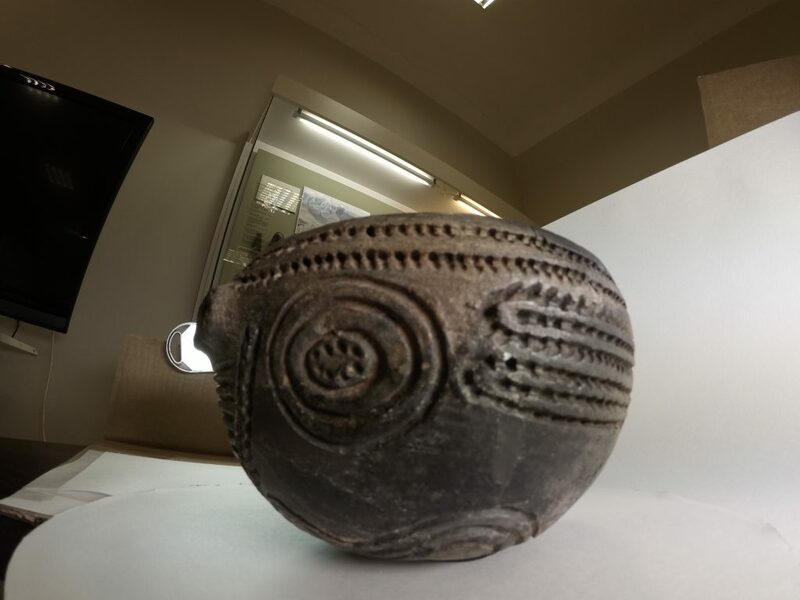 Now they can be, with this clay pot that is 4500 years old and also a portative astronomic device of the Early Bronze Age! 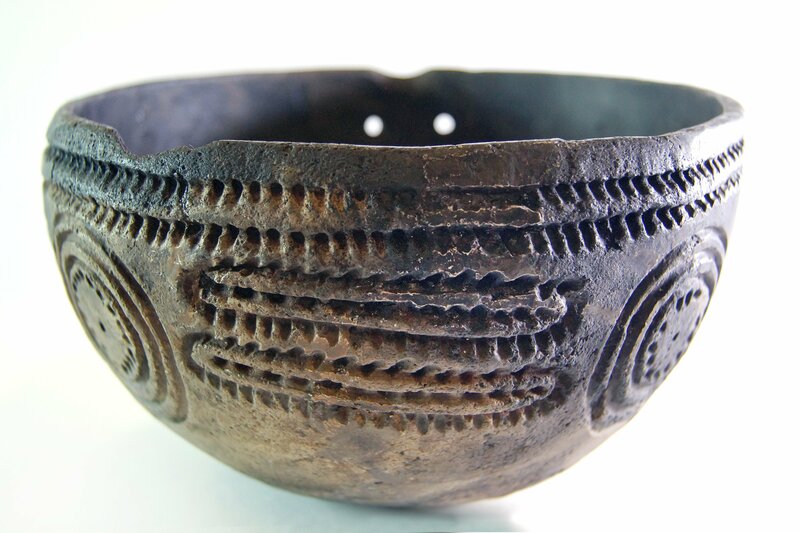 There is substantial material and scientific evidence that proves the ancient people who lived on the territory of Ukraine were engaged in this complex science.